Hey Gang! It's Irwin the Disco Duck and the Wibble Wabble Singers and Orchestra bringing you those great disco tunes you know and love! Actually, I was disappointed to find that Irwin only sings on the first song. However, he does introduce all the other songs in that wonderful fake Donald Duck voice of his. If you didn't know what the songs were, you'd be hard pressed to figure out what the heck he was saying. To me, "Silly Love Songs" sounds like "Suey Buzzsaw", and "Kung Fu Fighting" sounds like "You're Too Fatty"! What song titles can YOU come up with?? THANK YOU!!! 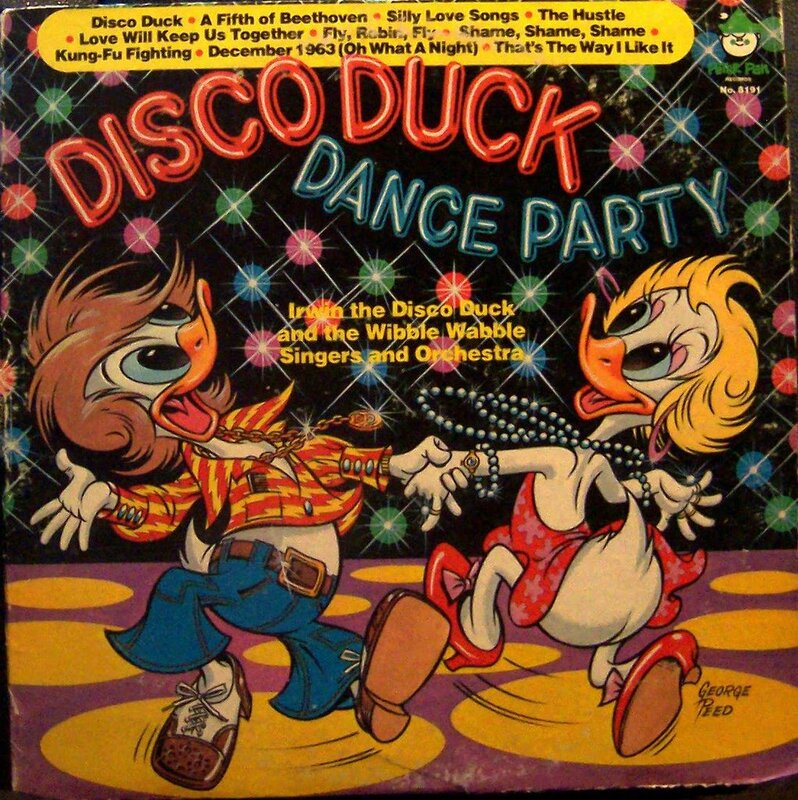 I've been hoping someone would post the Disco Duck albums and you've answered my prayers. If you ever happen to come across either the Star Wars-themed or the Sesame Street-themed DD album (or hopefully both), please post them. This child of the late 70's would greatly appreciate it. And congrats on such a great site! Tony, do you know whether "Irwin the Disco Duck" was, as I suspect, obscure-music expert Irwin Chusid? The latter Irwin has a show on WFMU-FM, which has regularly featured Duck voices (such as a duck-voiced version of the very-scary Christian hand puppet anthem "Diary of an Unborn Child"). ohmigod, i wore this record out when i was little! brings back good memories! holy crap. thought i was the only one too. i am in agreement with the first poster. i had the star-wars themed album a million years ago, then broke it somewhere down the line. i found it again in university at a chance encounter at a thrift store, and my friend promptly sat on the record 5 hours later. *argh. * this was back in '02 - i am still scouring thrift stores. Do you by any chance have the "Mickey Mouse Disco" album? That was one of my favorites!! It had the songs "Macho Duck", "Mousetrap!" and even a disco remix of "Chim-Chiminy"! I have been looking for this for soooo long! My brother and I had chicken pox in the 70's and thought the cure would be to put peanuts in a teeny dixie cup with water on the record spinnin' on our fischer price record player and make special "soup" that would cure us...maybe it worked?? (Although my brother did get a second batch of chicken pox, so maybe not.) I remember the cover like it was yesterday. Although I am convinced that the song Car Wash on it. Am I thinking of another album with a duck on it, or am I wrong?